We chose the Premium model, as seen at right, as it can support up to 100 pounds per shelf. The shelves’ sides are nine-ply half-inch laminated Birch, while the bottom is 1/4″ MDF, covered with a white easy-clean coating. For the slides, we went with Blum full-extension sliders. These are not as nice looking—nor as smooth-rolling—as the ball-bearing models, but they add strength to the shelves, as they attach to the edge and bottom of each shelf. and are covered with a lifetime (instead of five-year) guarantee. I measured everything out and submitted my order for five slide-outs; they recommend you measure and order one first, to make sure you’re doing it right, but I’m not a smart person, so I went all in. 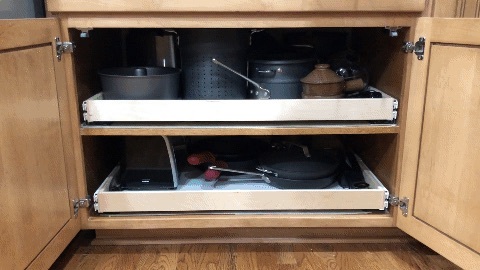 Amazingly, all my measurements were spot on, and all five shelves fit perfectly. The installation went very quickly, once I stopped trying to use their instructions. They recommend you put the slides/mounts in the cabinet loosely, then attach the shelf and position. I tried it this way with the first one, and it was really tricky. For the rest, I assembled the slides onto each shelf, then just lifted the whole assembly into position. I found this method much easier. Keep in mind you will lose some space with the slideouts—they sit about a half-inch off the underlying shelf, and you lose the edge space on each side due to the slide hardware. For us, being able to reach stuff at the back of each shelf makes this tradeoff well worth it. The best part of this project is that it was nowhere near as expensive as I figured. 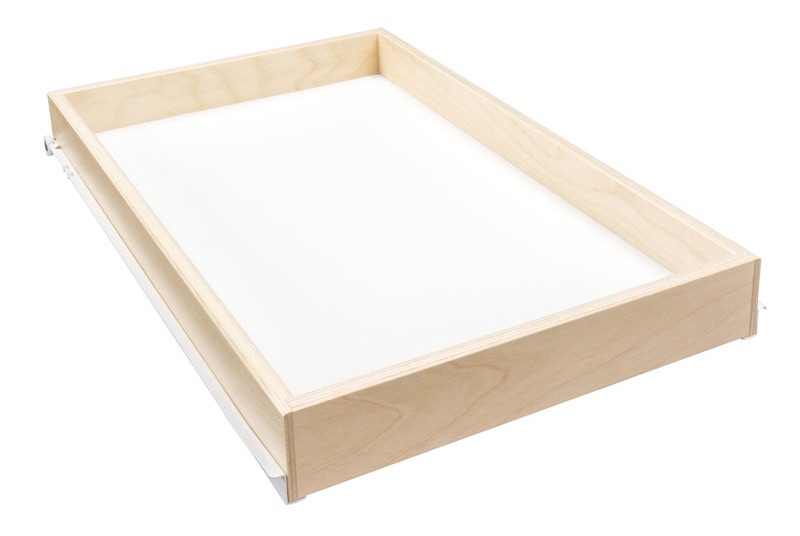 The small pull-out I linked above from Amazon is 21″ wide and costs $60; these drawers—with the pull-out sliders included—ranged from $75 for the smallest (24″ wide) to $85 for the largest (34″). Not inexpensive, but very fair when compared to the much smaller unit. With a 100 pound weight limit, they should work just fine in our kitchen for years to come. I also chose this company, but I let them measure and install. Well worth it. You must live in Arizona :). I have been engaged in this project for awhile… got a mix of suppliers for the narrow cabinets. I have the same goals as you for the wide ones….. full extension and 100 pound limit. I planned to build these myself because I’m not convinced ¼” MDF is strong enough to support the middle of such a wide shelf, especially if one stores cast iron cookware. My question is: would it be easy to remove the MDF from these Shelves That Slide and substitute a sheet of the ½” birch ply? Are the STS sides rabbited for the MDF or is the MDF [perhaps] just stapled to the sides? Or glued? The shelves have two reinforcing strips of birch under the MDF that run from front to back, which should help. In looking at it, I think it’d be really tough to get the MDF out—the reinforcing strips below, and it’s in a track in the other three sides, and they look quite securely attached. When my wide shelves arrived, I was a bit worried about the weight, but I didn’t see any flex or deformation even with my most heavily loaded shelf (it’s probably about 60 pounds worth of stuff). They might do a custom shelf for you if you were to ask–you’d pay more, of course.